Harmonic gearing utilizes a unique operating principle which is based upon the elastic mechanics of metals. The greatest benefits are the zero-backlash characteristics and the weight and space savings compared to other gears because our gear mechanism consists of only three basic parts. 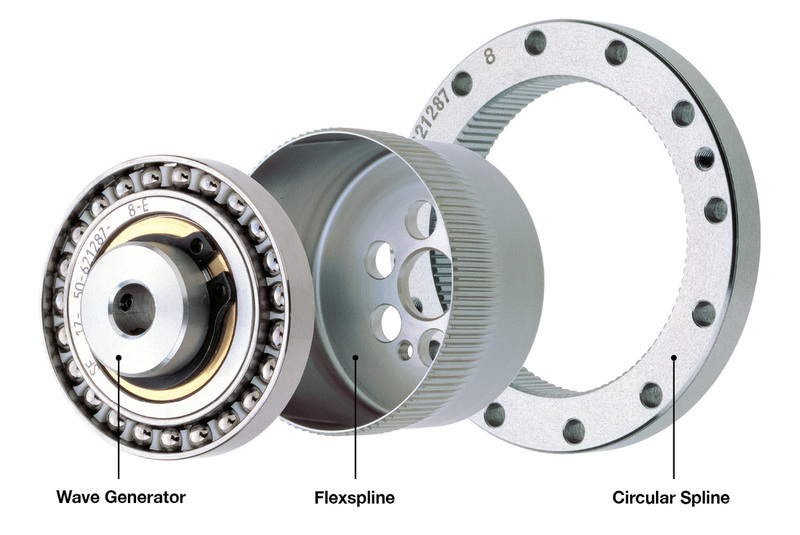 They are the: Wave Generator, Flexspline and Circular Spline. This simple three element construction combined with the unique operating principle allows extremely high reduction ratio in a very compact and lightweight package. Neither the size nor weight of the gear vary with the reduction ratio. The high performance attributes of this gearing technology including zero backlash, high torque, compact size, excellent positional accuracy and repeatability are all a direct result of the unique operating principle. ​​Below is an exaggerated two-dimensional diagram demonstrating how the three gear elements engage and rotate. ​The Flexspline is slightly smaller in diameter and has two fewer teeth than the Circular Spline. The elliptical shape of the Wave Generator causes the teeth of the Flexspline to engage the Circular Spline at two opposite regions across the major axis of the ellipse. For every 180 degree clockwise rotation of the Wave Generator the Flexspline teeth are advanced counterclockwise by one tooth in relation to the Circular Spline. Each complete clockwise rotation of the Wave Generator results in the Flexspline moving counter-clockwise by two teeth from its original position relative to the Circular Spline. Because the gear teeth are always fully engaged in a region along the major axis, Harmonic gearheads have zero backlash. Harmonic Drive is a registered trademark of Harmonic Drive LLC.